Collaborative science brings together diverse stakeholders to share knowledge and form networks that in turn can be foundational to policies and practices to increase socio-ecological resilience. In this article, we present results from a collaborative science project that employed collaborative learning methods to develop a network of local, regional, state and academic stakeholders. These stakeholders had little social interaction prior to the project and represented a diversity of views, positions and responsibilities. They shared in common a concern for the effects of climate change on a coastal socio-ecological system and the desire to reduce vulnerabilities and enhance resilience. Through ethnographic and survey methods, we found that collaborative science and learning promoted the exchange of cultural and environmental knowledge and expertise among individuals who previously had no sustained interaction. Stakeholders perceived these exchanges as worthwhile in that they allowed individuals to express viewpoints and share knowledge and expertise, which was seen to have the potential to increase socio-ecological resilience. 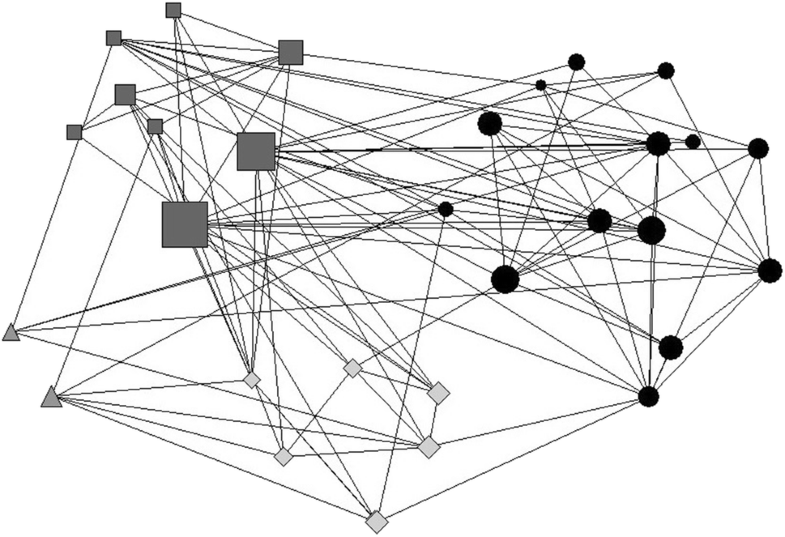 Our results suggest that social networks can emerge from collaborative science and learning projects and can become formally organized and help foster opportunities to enhance socio-ecological resilience. Coastal regions across the USA are vulnerable to impacts from climate change such as accelerated sea-level rise, storm surges, inland flooding, and erosion (Moser et al. 2014, p. 580), affecting built infrastructure and natural ecosystems (Titus et al. 2009, pp. 21–23). These problems and impacts are likely to increase, as global-mean sea level rose at an average rate of 1.7 mm (± 0.22 mm) per year during the twentieth century (Church and White 2011, p. 585), and is projected to further increase for all emission scenarios (Church et al. 2013, p. 1140). Robust and effective adaptive capacity and increases in socio-ecological resilience are needed to reduce the risks and vulnerabilities of these coastal communities. Development of adaptation and resilience strategies applicable to new socio-ecological dynamics resulting from climate change will require the integration of scholarly and practical expertise. Coastal communities are part of socio-ecological systems (SES), and their adaptation efforts need to focus on understanding and increasing socio-ecological resilience as a key element of their sustainability (Hay et al. 2013; Adger et al. 2005). Socio-ecological resilience, in this context, refers to the capacity of coastal communities to (1) withstand disturbances such as sea-level rise or extreme weather events so as to retain essential structures and functions of the coupled human and natural systems, (2) self-organize, and (3) learn and adapt (Adger et al. 2005, p. 1036). A vital component of this adaptive capacity is the involvement of stakeholders with a diversity of environmental knowledge, expertise and experiences to ensure accurate and equitable representation of human and environmental interests and needs (Lazrus 2012, pp. 290–293; Maclean et al. 2014, p. 149; Ross et al. 2010, pp. 129–140; Ford et al. 2006, pp. 131–134). Adaptive capacity and socio-ecological resilience can be greatly enhanced through robust and strong social networks. An important priority in research, then, is to understand how to promote and sustain the interaction of diverse individuals, many of whom have not had experience working together and who also may perceive conflict in their environmental and community needs (Daniels and Walker 2001, pp. 40–48). Of equal importance is the need for research on how such interactions can be sustained to form established networks of social relations that lead to increased socio-ecological resilience. The fostering of robust and strong social networks engaged in community and ecological work can lead to effective transformations of SES and increased adaptation (Barnes et al. 2017, p. 16; Bodin et al. 2011, pp. 3–28; Crona and Hubacek 2010; Crona et al. 2011, pp. 44–72; Prell et al. 2009, pp. 501–518; Prell et al. 2010, p. 34). These social relations and exchanges of knowledge and expertise can span and connect local and non-local stakeholders, with corresponding increases in the interactions of different forms of cultural knowledge about and experiences with a changing environment and climate. As a result, stakeholders with local and community knowledge and experience may interact with non-local stakeholders who may be environmental or climate scientists, government decision makers, or non-governmental advocates. In this article, we demonstrate through a case study how collaborative science and learning can promote the sharing of environmental knowledge and experiences among local and non-local coastal stakeholders. The research was based in the Chesapeake Bay region along the East Coast of the USA, a region projected to experience significant accelerated sea-level rise and increased storms due to climate change (Boesch et al. 2013), and inhabited by coastal communities dependent on commercial fishing, tourism, and the influx of retirees relocating to the area (Johnson 2016). Conducted between 2012 and 2015, the study focused specifically on the Deal Island peninsula, a 24 square kilometer region along the lower Eastern Shore of the Chesapeake Bay (Johnson et al. 2017). Our research activities included qualitative and quantitative data collection, workshops, collaborative research projects and public community conversations. Social science research emphasized local and non-local understanding of climate change, resilience, heritage, and the valuation of ecosystem services. Ecological research focused on the restoration of ditch-drained marshes using the technique of ditch-plugging (Needelman et al. 2015; Johnson 2016; Johnson et al. 2018; Wainger et al. 2017). This method was intended to restore more natural hydrological conditions as a means to improve marsh sustainability in the face of rising sea levels. Data were gathered related to hydrology, soils, plants, elevation change, mosquitoes, and fish. The ecological research served to engage academic researchers in the broader project and to catalyze discussions between stakeholders about the potential benefits and tradeoffs of this marsh restoration option. The research engaged stakeholders with a diversity of environmental knowledge, expertise and experiences. This diversity of participation increased the likelihood of identifying risks and solutions relevant to a broad range of peninsula stakeholders. The network that resulted from these collaborative learning activities consisted of individuals with both similar and diverse cultural views of the community and environmental challenges of the Deal Island peninsula, and an interest in and commitment to keep working together to foster increased socio-ecological resilience. We focused on answering two fundamental research questions of significant practical importance. First, we investigated the degree to which our research stakeholders interacted with each other outside of the project’s collaborative learning activities. Answering this question helps us evaluate the effects of collaborative learning activities on the development of social relations, useful for actions that can increase socio-ecological resilience. Second, we analyzed stakeholders’ assessments of the usefulness of participation and its potential to promote exchanges of environmental and community knowledge and experiences that can lead to increased socio-ecological resilience. 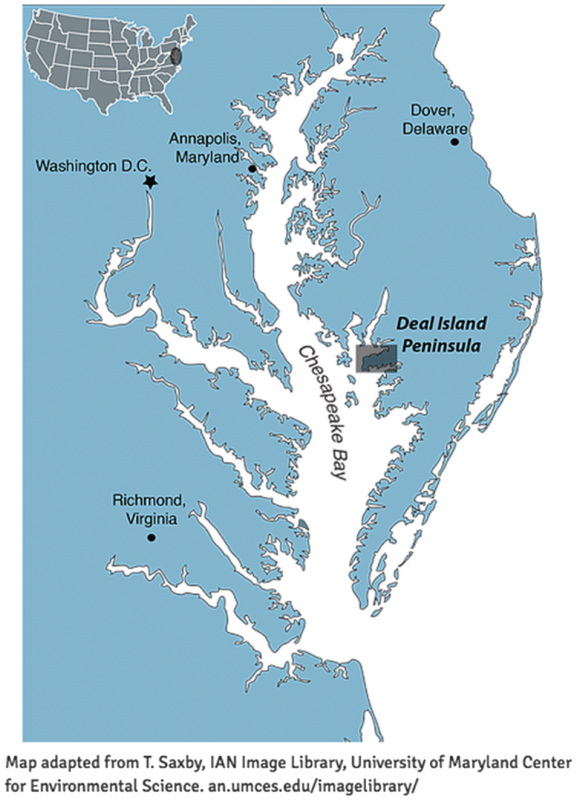 The Deal Island peninsula extends into the Tangier Sound of the Chesapeake Bay in Maryland, USA (Fig. 1). It is a low-lying, flat, and sparsely populated area of about 1000 individuals in several small communities geographically distributed among dynamic estuarine marshes (U.S. Census Bureau 2015). Despite their seeming isolation even from one another, people here are tied together historically, socially, and ecologically. Area families have relied upon harvesting of seafood, primarily crabs (Calliencecus sapidus) and oysters (Crassostrea virginica), or associated activities of the seafood industry for their livelihoods. People in the area are close-knit, self-sufficient, and take pride in their history, heritage, and care for one another (Johnson 2016, 24–29). They have relied upon local institutions such as churches and other volunteer organizations to provide social support within the community. As one community member reported: “The resilience of the community is highly interdependent. Down there people aren’t on their own” (NOAA Science Collaborative Project Stakeholder Interviews 2014). However, the composition of the community is changing due to several factors which alter traditional social dynamics. Fisheries-based livelihoods can be difficult in the current economy. Today, most families find it necessary to have at least one adult working in nearby towns for income and benefits, or make the decision to move away to acquire jobs with more economic stability (Johnson 2016). Therefore, the population has been in decline since World War II and the area has a high proportion of residents over 65, with low numbers of children and young adults (U.S. Census Bureau 2015). Retirees and vacation homeowners acquire property here due to its beauty, affordability, and peace and quiet, but sometimes find integrating into the community difficult due to cultural differences (Johnson 2016). Independence and self-reliance are characteristics that have enabled families to survive and adapt here for over 300 years, but also caused them to shy away from formal governance, with communities choosing not to develop town governments. While this strategy had worked for centuries, they are now less capable of responding to the threats of climate change due to a lack of means to organize internally, or to interact and respond externally to government and other organizations. Ethnographic research identified two key vulnerabilities felt by area residents: shoreline erosion and changing socio-economic conditions within the community (Johnson 2016). Predicted future climate change suggests significant direct impacts to the region, including increased temperature, flooding, storm frequency and severity, erosion, and submergence of wetlands (Najjar et al. 2010). Indirect impacts include increased carbon dioxide levels, water temperature, salinity, harmful algae, and hypoxia (Najjar et al. 2010). In addition, the submerged aquatic vegetation, which is critical to the Chesapeake Bay’s health, will be reduced and ecosystem relationships will be altered, resulting in changes to the currently favored Bay species (Najjar et al. 2010). Relative sea levels in the Chesapeake Bay have increased about twice the global average and are likely to increase further (Yin et al. 2010, p. 4598). A 2013 report by the Maryland Climate Change Commission predicts a 2.1-foot (0.64 m) rise in sea level for the Chesapeake region by 2050 and warns of further threat from flooding and increased storm severity (Boesch et al. 2013). These effects will be felt sooner and with greater intensity in the Deal Island peninsula area because the average elevation of land is only about three feet (0.91 m). Significant increases in water will cause the degradation and submergence of land and wetlands, additional flooding in streams and ditches, and greater erosion. The average shoreline erosion rate in Maryland is one foot per year, while rates of erosion for some areas of the Deal Island peninsula are eight feet per year (Maryland Department of Natural Resources 2008). As one informant said of the area: “That place is as dynamic as can be and as the shoreline erodes, if you don’t armor the shorelines down there, they disappear” (NOAA Science Collaborative Project Stakeholder Interviews 2014). For some areas of the peninsula, hundreds of meters have been lost.1 In some areas, erosion is now a concern not only for shoreline homeowners, but also for those farther inland for whom altered coasts and waterways threaten flooding during high tides and storms (NOAA Science Collaborative Project Workshop January 2016). These and other future ramifications of climate change impacts are just beginning to be understood at the local level. Peninsula residents have managed historic and continuing challenges and provide a stellar example of human adaptation to changing environmental and socio-economic conditions. Long-time residents know that success depends on adaptable livelihood strategies (Johnson 2016). To a certain degree, island residents view change as inevitable, something part of a natural cycle. However, the pace of change is accelerating and moving in new directions for which Deal Island peninsula residents are less equipped to handle. Therefore, local residents, academics, and government representatives have partnered in a collaborative science project to help better define and strategize options to cope and adapt in the future (Johnson 2016). The research reported in this article was conducted from 2012 to 2015 with the goals of (1) establishing a continuing collaboration among local community, state and federal agency, academic, and non-governmental organization stakeholders working toward the enhanced resilience of the marshes and local communities of the Deal Island peninsula; (2) developing and testing a broadly transferable process of engaging diverse stakeholders to learn and share knowledge and experiences; and (3) better understanding the provision of socio-ecological services by marsh systems and decision-making processes within the stakeholder community. Underpinning these research goals is the idea to foster understanding, trust, and collaboration among local and non-local Deal Island peninsula stakeholders. The building of trust and understanding is an important component of efforts to build socio-ecological resilience that is often not included in resilience programs (Carpenter et al. 2012). To this end, our research used a collaborative learning approach. Developed by Daniels and Walker (2001), collaborative learning uses tools and example activities to address situations of environmental conflict and support participatory decision making (see below). Learning through collaboration is a central component to working through and resolving complex and contentious environmental problems. Daniels and Walker stress that collaborative learning moves beyond simply defining consensus with public involvement but instead focuses on the “potential for mutual learning through public involvement activities” (Daniels and Walker 2001:264). Additional discussion of the theory and method of collaborative learning can be found in Feurt (2008) and Johnson et al. (2018). Our collaborative learning activities included a series of day-long workshops that served to both communicate and distribute information among a fairly consistent group of core stakeholders through scientific presentations and peer-to-peer sharing. Stakeholders also participated in collaborative research projects that were designed as stakeholder-led investigations in key areas of flooding and erosion, marsh restoration, and heritage. These activities were designed to share knowledge and build new relationships among participants. By linking stakeholders from the local community to others at the county, state, and federal levels, the research fostered new networks that could be used to develop and support marsh and community resilience activities. In addition, community conversations were developed to share results and information with the general public (Fig. 2; for more information, see Johnson et al. 2017). The project consisted of an extended network of around 60 stakeholders representing local communities, government and environmental management entities, social and environmental researchers, and non-governmental organizations. Around 30 stakeholders were very active in research events and were considered core stakeholders (Johnson et al. 2017; Needelman et al. 2015). In Spring 2015, we implemented an online survey to collect information on stakeholders’ socio-demographic backgrounds, relationships to each other outside the project, and their experiences in the research to date (Qualtrics 2015). 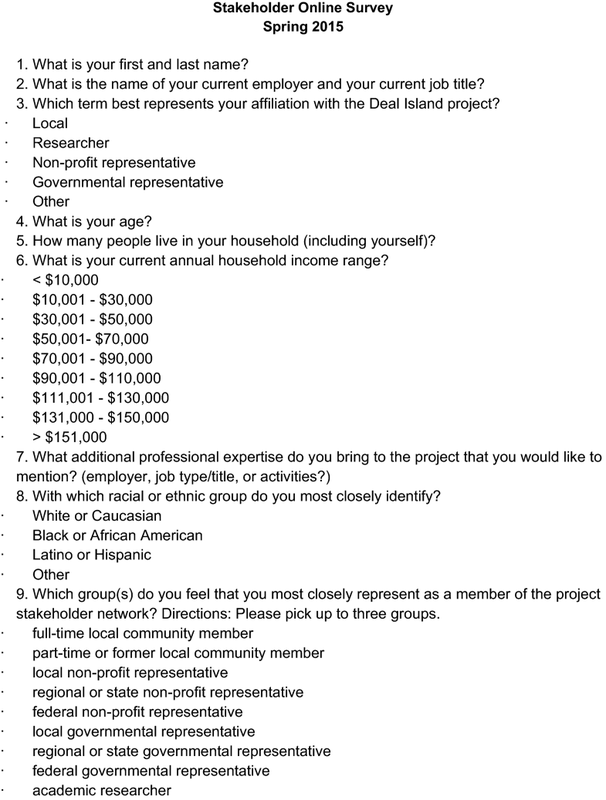 The survey collected information on individual demographic backgrounds, including age, current employment, group affiliation (e.g., local, researcher, government representative), household size, annual household income, professional expertise brought to the project, and racial or ethnic identity. 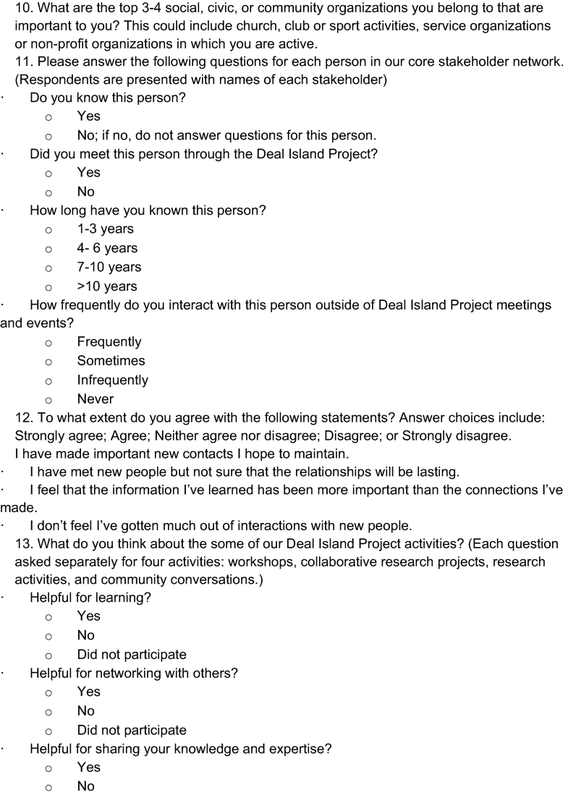 The survey also collected information on the stakeholder network via listing all names of project participants and asking stakeholders to rate their frequency of interaction with each stakeholder outside of collaborative learning activities (1 = frequent, 2 = often, 3 = sometimes, and 4 = very little). The survey also sought information on stakeholders’ experiences in the project with questions on the value of participation, opportunities to share knowledge and expertise, what they have learned about Deal Island peninsula SES, and their ratings of key environmental threats facing the island. Survey findings added quantitative insights to complement ethnographic and qualitative findings on local versus non-local understandings of vulnerability and resilience (Johnson 2016). In the following sections, we present findings from the survey and insights from the ethnographic research. We focus first on network analysis and then stakeholder participation and learning. The questionnaire was sent to 34 core project stakeholders who had regularly participated in the collaborative learning activities; 31 stakeholders submitted complete questionnaires; two additional stakeholders completed only the social network component of the questionnaire. See “Appendix” for the survey questionnaire. Our first research question was whether stakeholders involved in the research were interacting with one another outside of planned collaborative learning activities. The collaborative learning activities were intended to facilitate interactions among stakeholders. If stakeholders were seeing one another on a regular basis, then the research activities would mainly enhance or strengthen those ties. 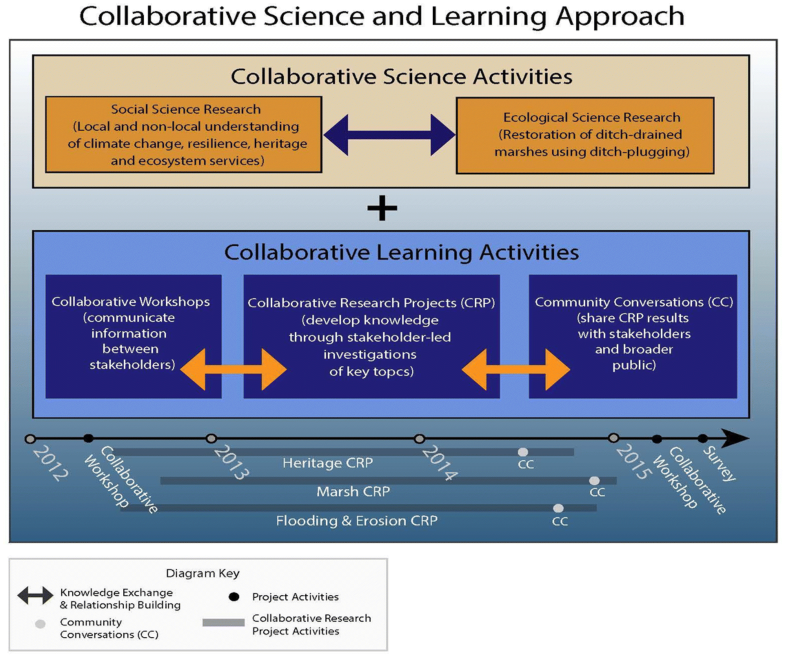 In contrast, if stakeholders had little to no contact with one another outside project activities, it would underscore our own ethnographic assessment that promoting ongoing collaborative learning activities in the future is necessary for building the kinds of relationships that will enable this SES to become more resilient in the face of climate change. Figure 3 shows a digraph of 33 stakeholders reported ‘frequent’ contact with one another outside project activities. Nodes represent individual stakeholders. Lines represent stakeholders who have frequent communication with one another outside meetings. The size of the nodes corresponds to stakeholders’ betweenness centrality scores, with larger nodes representing stakeholders with higher betweenness scores. By betweenness centrality, we mean the number of instances in which a given stakeholder connects two otherwise disconnected stakeholders. Betweenness centrality is a common measure found in social network analysis (Freeman 1979) for identifying powerful individuals that potentially control the flow of information. In the context of environmental governance, it has been used to identify important stakeholders (e.g. Prell et al. 2009) and to identify knowledge brokers (e.g. Cvitanovic et al. 2017). In Fig. 3, the larger nodes represent those stakeholders who rest between (or bridge) stakeholders who do not have a lot of frequent contact with one another outside of project meetings. Some key patterns emerge from the data presented in Fig. 3. First, we notice that local residents (the circle shaped nodes) appear to cluster more tightly together, i.e., there is a higher presence of ties representing ‘frequent interactions’ among them. In contrast, the two stakeholders from NGOs (the triangle nodes) do not have frequent interaction with one another outside project meetings. Local residents also do not have high, frequent interaction with government officials (the diamond nodes), and aside from 2 to 3 researchers, they also do not interact much with researchers outside of our collaborative learning activities. Taken together, Fig. 3 suggests there is a high amount of ‘within stakeholder group’ interaction(s) and few ‘between stakeholder group’ interactions. To explore this contrast between within and between stakeholder groups further, we created a table displaying the density between and within each stakeholder group. Density refers to the proportion of possible ties in a network that actually exists. In our analysis, density scores may range between 0 and 1, where higher scores indicate more ties among the subset of actors (i.e., more density), and lower scores representing fewer ties (i.e., less density). Table 1 clarifies and reinforces some patterns we detected in Fig. 3. Locals, with the highest density score of 0.48, have the most interaction with each other outside of collaborative meetings and activities. Researchers and government affiliates also have relatively high-density scores (0.43 and 0.31, respectively), and as noted earlier in reference to Fig. 3, NGO affiliates do not have any frequent interactions with one another outside project meetings and, hence, have a density score of 0. Finally, when looking at the off-diagonal density scores, which represent density scores between each stakeholder group, these between-group scores are much lower than their within-group counterparts. This again reinforces the patterns observed in Fig. 3. Taken together, Fig. 3 and Table 1 suggest that our collaborative learning activities are necessary for bringing together stakeholders from different social categories (and in some cases, even stakeholders within the same category). Without the collaborative learning activities, many of our research stakeholders would not have much interaction with one another and hence may not have opportunities to engage in meaningful conversations that could lead to a comprehensive understanding of the Deal Island peninsula socio-ecological system. There are some exceptional actors, however, who do not correspond with the general trends noted above. Figure 3 shows the nodes representing stakeholders as having different sizes. Here, we have scaled the nodes according to each stakeholder’s betweenness centrality score. The stakeholder with the most betweenness centrality in Fig. 3 is a large, square node resting in the center of the graph. This person is an anthropologist who has lived and done ethnographic research in the area for years, and was a primary leader in developing this collaborative research effort. Informal conversations with this stakeholder reveal that he often feels he is fulfilling the role of a facilitator within the overall project, making sure all who have been invited are coming to the workshops and field activities, and that he is probably the one having the highest number of informal talks with others on a regular basis. The person with the second highest betweenness score was, at the time of the survey, a PhD student in anthropology who similarly had been conducting research in the area and also spent significant time communicating with all stakeholders regarding past and upcoming collaboration activities. We conducted a survey questionnaire to answer our second research question on the usefulness of participation in the project and its potential to promote exchanges of knowledge and experiences that can lead to increased socio-ecological resilience. The survey asked stakeholders to assess the degree to which key collaborative science and learning objectives of the project had been achieved. Overall, 94% of the 31 stakeholders with complete surveys either ‘strongly agreed’ or ‘agreed’ that their participation in the research was worthwhile. Additionally, 87% (n = 27) of the respondents either ‘strongly agreed’ or ‘agreed’ to continue their participation in the research (Table 2). The questionnaire responses also provided insight on why stakeholders found their participation worthwhile. Ninety-seven percent (n = 30) of survey respondents reported that they either ‘strongly agreed’ or ‘agreed’ that the project was creating opportunities to share knowledge and expertise. All 31 survey respondents reported that they either ‘strongly agreed’ or ‘agreed’ that they were gaining new knowledge and expertise from each other (Table 2). These findings suggest that the collaborative learning activities were able to create meaningful social exchanges among stakeholders who previously did not interact with each other, to the point that participants expressed a strong willingness to continue to collaborate within the research. However, there were still some reservations and concerns. Although stakeholders reported learning new knowledge and expertise, 39% (n = 12) of them were either ‘neutral’ (neither agree or disagree) or ‘disagreed’ with the statement “I feel others have learned from my knowledge and expertise,” suggesting some uncertainty among stakeholders about the degree to which they believe their knowledge and expertise affects others (Table 2). Additionally, while 87% (n = 27) of respondents either ‘strongly agreed’ or ‘agreed’ with the statement that the research “has the potential to continue improving the resilience of the Deal Island area in the immediate future,” about 36% (n = 11) reported that they were either ‘neutral’ (neither agreed or disagreed) or ‘disagreed’ with the statement that the “research has improved the resilience of the Deal Island area” (Table 2). If participation in collaborative learning activities resulted in stakeholders learning new knowledge and expertise, what exactly did they learn? 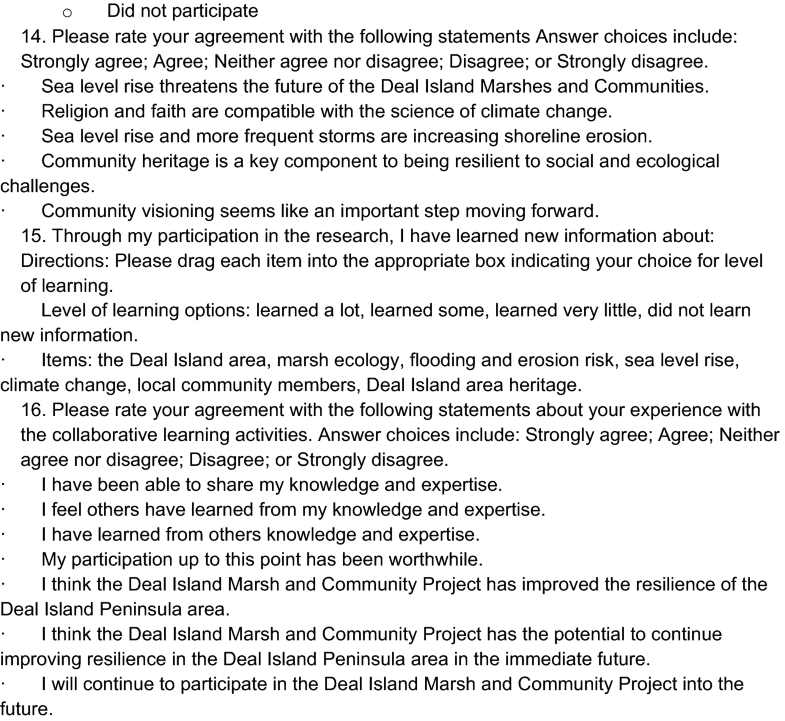 The questionnaire asked stakeholders about how much they were learning about key socio-cultural and environmental factors that affect Deal Island peninsula socio-ecological resilience. An interesting pattern emerged in the responses. Stakeholders reported learning more about socio-cultural characteristics of the socio-ecological system than environmental vulnerabilities. 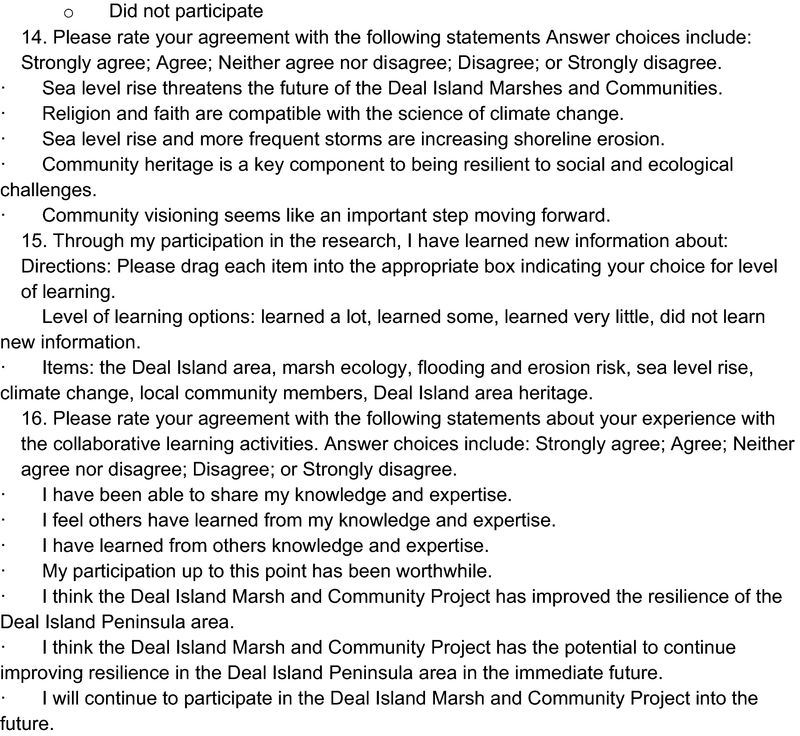 Ninety-four percent (n = 29) of stakeholder respondents reported having learned either ‘a lot’ or ‘some’ about local community members, and 87% (n = 27) of respondents reported having learned either ‘a lot’ or ‘some’ about Deal Island heritage (Table 3). These same stakeholders reported lower levels of learning about marsh ecology [‘some learning’ (45%, n = 14); ‘very little learning’ (13%, n = 4) and ‘no new information’ (10%, n = 3)], flooding and erosion risks [‘some learning’ (42%, n = 13), ‘very little learning’ (23%, n = 7)], sea-level rise [‘some learning’ (55%, n = 17), ‘very little learning’ (13%, n = 4), and ‘no new information’ (10%, n = 3)], and climate change [‘some learning’ (55%, n = 17), ‘very little learning’ (13%, n = 4), and ‘no new information’ (16%, n = 5)] (Table 3). The pattern of the above findings, which parallel ethnographic insights, reflects the intent of our project. The collaborative learning activities were designed to provide opportunities for stakeholders who did not know much about each other to exchange perspectives, ideas and experiences. Since many were not very familiar with each other, major elements of their exchange included content of a more personal and professional nature. While environmental expertise was exchanged, it was done so with caution that often characterizes the beginning of a social relationship or exchange, in part due to concerns about how such environmental expertise would be received. It is the case that some of the stakeholders maintain contrasting or even conflicting views on climate change topics such as sea-level rise and the role of humans in causing climate change. Additionally, many of the stakeholders already had significant scientific or experiential knowledge of the peninsula’s environmental factors, and how they are changing. The environmental information included in the collaborative learning activities may not have been new or novel to some of the stakeholders. Finally, although stakeholders reported lower levels of learning about environmental factors, they did report comparatively high levels of agreement with knowledge statements about sea-level rise as a threat to the Deal Island peninsula socio-ecological system. Almost 94% (n = 29) of respondents either ‘strongly agreed’ or ‘agreed’ with the statement that sea-level rise threatens the Deal Island community and marshes, and 90% (n = 28) either ‘strongly agreed’ or ‘agreed’ with the statement that sea-level rise and more frequent storms are increasing shoreline erosion (Table 4). Conversely, knowledge questions focused on cultural and social issues revealed less agreement. Only 58% (n = 18) reported that they either ‘strongly agreed’ or ‘agreed’ with the statement that “religion and faith are compatible with the science of climate change.” Given that our stakeholders are a mix of local community members, many of whom are strongly religious, and scientists and natural resource managers, with strong science-based worldviews, it was not surprising to see less agreement on the roles of faith and science (Table 4). Agreement did appear on their knowledge in response to the statement “community heritage is a key component to being resilient to social and ecological change”. Eighty-four percent (n = 26) either ‘strongly agreed’ or ‘agreed’ (Table 4). Increasing socio-ecological resilience is a long-term goal for Deal Island peninsula stakeholders, both for those who live locally as well as those from outside the community engaged in research, governance, and advocacy. Our ethnographic and survey results suggest that collaborative science and collaborative learning promoted the exchange of cultural and environmental knowledge and expertise among individuals who previously had no sustained interaction. These exchanges were perceived by stakeholders as worthwhile in that they allowed individuals to express viewpoints and share knowledge and expertise, which was seen to have the potential to increase socio-ecological resilience. Interestingly, this increase in learning and sharing was reported more for socio-cultural topics (local community and heritage) than ecological ones (marsh ecology, flooding and shoreline erosion). While stakeholders did not feel that the research had yet resulted in increased socio-ecological resilience, it is significant that stakeholders have diversified their contacts and can now more easily turn to others for advice or help in addressing vulnerabilities. Our research also provided a venue for shared learning and communication that allows stakeholders to voice viewpoints and learn from others, especially those with differing perspectives. Our research also reveals that generating, maintaining, and strengthening social relations is important. It is through social relations that trust is built, knowledge is exchanged, and learning on deeper levels occurs. Social relationships inform the way individuals understand and interact with the natural environment. Therefore, harnessing the social networks through which cultural knowledge is distributed is important for the success of future adaptation. Following the completion of this collaborative science and learning project, our research stakeholders responded to an opportunity to develop an Integrated Coastal Resiliency Assessment (ICRA) for the peninsula. A two-year project, the ICRA combined geospatial, cultural, social and environmental research to (1) identify specific ecosystem and community vulnerabilities to climate change impacts and (2) assess possible restoration and adaptation strategies.2 It relied extensively on the network of stakeholders that emerged out of this science collaborative and learning project. The focus shifted to assessment of vulnerable areas and the development of interventions. This research on the socio-ecological system has led to practical actions and identified targets for resilience-building interventions. Our current successes would not have been possible without a collaborative science and learning approach that integrated research and practice. As we look toward the future, and contemplate both how to sustain our network of stakeholders and guide the network from knowledge exchange to interventions, we recognize value in exploring complementary conceptual frameworks and practices. For example, our collaborative learning efforts have facilitated knowledge exchange and the building of social relations. However, to translate our facilitated knowledge exchange into actions we need clearer conceptual and methodological guidance. One potentially useful approach is what Forester calls “deliberative improvisation” (Forester 2018, p. 2; see also Innes 1995). Using argumentation and debate, scientific research and local and independent knowledge, this planning practice helps groups identify problems and facts that really matter and employs negotiation to help produce agreements on action. The practice is iterative but deliberative in its emphasis on sharpening the focus of discussion and debate on the key problems that matter and what is known and needed to act (Forester 2018, p. 2). We also see value in exploring how and when to shift from a collaborative learning approach to collaborative adaptive management (CAM) (Susskind et al. 2012, pp. 47–48). Many of the principles and practices of collaborative learning are similar to CAM; however, the latter emphasizes the development and measurement of specific management objectives and joint fact finding efforts earlier in the collaboration process (Susskind et al. 2012, p. 48). The ICRA described above and the formation of DIPP were actions that emerged out of collaborative learning activities. While we have an implicit and general understanding of how these actions developed, more formal and explicit attention to the deliberative and management processes that lead to interventions could significantly increase our network’s contribution to Deal Island Peninsula’s socio-ecological resilience. The work of our stakeholder network is driven by and contributes to a shared understanding of the Deal Island Peninsula as a special place worthy of our combined efforts to sustain and protect. It is more than an environment, but rather it is a place whose construction and meanings result from the interplay among cultural, social and biophysical factors. Research has shown that ‘sense of place” can be a motivation for long-term stewardship at multiple scales (Chapin and Knapp 2015, p. 38). Our network includes stakeholders from different socio-geographical scales who share a commitment to working together to increase socio-ecological resilience. However, each stakeholder engages in our collaborative learning activities based on different, although often overlapping, configurations of environmental knowledge and experiences. We are interested in how these different cognitive frameworks and environmental histories create a ‘sense of place” that motivates individual and group actions to increase socio-ecological resilience (Masterson et al. 2017, p. 49). 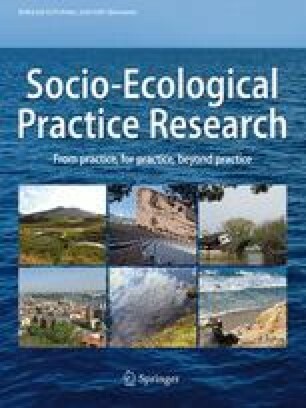 In terms of future practice research, important questions emerge about how our collaborative learning activities contribute to and shape the emergent properties of stakeholders’ ‘sense of place,’ and about if what we learnt suggests lessons and patterns that can inform other coastal socio-ecological systems (Masterson et al. 2017, p. 49). We are confident that the opportunities and challenges for DIPP in the future will require a continuation of integrated research and practice. While our research and applied focus are on the Deal Island peninsula socio-ecological system, we also recognize the importance of expanding our collaborations with other researchers and practitioners who might see potential in developing a multi-scale network of stakeholders to address vulnerability and build socio-ecological resilience. The environmental, socio-cultural and economic challenges in coastal areas worldwide will require new configurations of research and practice, so that data and findings can be directly and quickly used to support the development of interventions that increase socio-ecological resilience. Maryland’s Department of Natural Resources’ Maryland Coastal Atlas provides detailed maps indicating shoreline erosion via shoreline change between 1841 and 1999. http://gisapps.dnr.state.md.us/coastalatlas/iMap-master/basicviewer/index.html. The ICRA was funded by Maryland Sea Grant (SA72581450-N). This research is funded by the NOAA Coastal and Ocean Climate Adaptations Program (COCA) (NA17OAR4310248). The authors would like to acknowledge funding from the National Oceanic and Atmospheric Administration’s National Estuarine Research Reserve Science Collaborative Program (Grant Number: 018245-001). In addition, we would like to thank project stakeholders for the time they graciously offered to be a part of this collaboration.